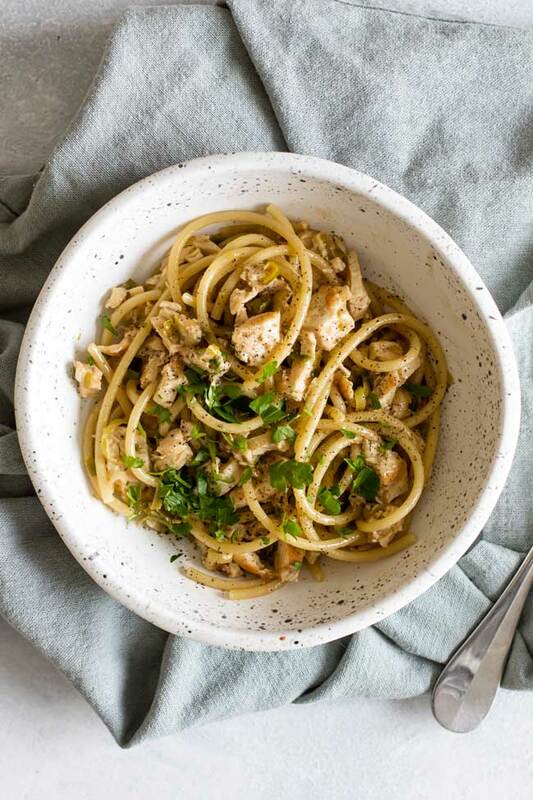 This lemon leek pasta with chicken for two is a light and flavorful dish. The light sauce is made with leek, butter, fresh lemon, and Parmesan cheese. Toss it with pasta and chicken and you get an easy-to-make dinner in just under 30 minutes. The recipe, post and photos have been updated from the archive. First published in January 2016. It seems fitting that the first recipe of 2016 (!) be a little bit lighter which means a lighter hand with the butter and cheese. After weeks of decadent dishes, sweet and salty snacks, and more bites of chocolate then I can count it’s nice to tuck into something a little easier on the waistline. 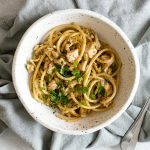 And while this leek pasta with lemon and chicken isn’t completely on the healthy side it’s definitely a step back from the super-rich dishes and treats from December. It’s a good way to ease into the new year. I like to start the pasta first. In the time it takes to boil it you can make the sauce. I like to use bucatini which is a long pasta shape that is thicker than spaghetti and hollow in the middle. It starts with a boneless, skinless chicken breast. I like to pound it out to an even thickness before cooking it in a little olive oil. This ensures it cooks evenly and, as a bonus, it will cook faster, too. After the chicken cooks, add the butter to the hot pan. Once it’s melted saute the sliced leeks in it until they’ve softened. Add a squeeze of fresh lemon juice to the pan with the leeks. It adds a bright flavor but it also makes it easy to scrape up all of the browned bits off the bottom of the pan, which gives the dish a richer flavor. At this point add the cooked pasta with a small amount of the starchy pasta water. Add the grated Parmesan cheese and toss, toss, toss it all together until the cheese has melted and the sauce has come together. Bucatini all’Amatriciana | Bucatini all’Amatriciana is a delicious pasta dish that takes less than 30 minutes to make. My version for two has pancetta, tomato sauce, a splash of balsamic vinegar and a generous pinch of crushed red pepper. Balsamic Mushroom Pasta | Mushrooms in a creamy balsamic sauce tossed with fettuccine pasta. It’s easy to make and so delicious! Spinach & Parsley Pesto | Pesto isn’t just for basil! This spinach & parsley pesto is full of fresh flavor and so easy to make. This easy pasta dish takes less than 30 minutes. Bring a pot of water to a boil over high heat. While you wait for the water to boil, heat the olive oil over medium heat in a 10-inch skillet. Season both sides of the chicken with salt. Cook the chicken for four to five minutes on one side. Turn it and cook it another few minutes or until it’s cooked through. Transfer the chicken to a clean plate. Once the water is boiling add the pasta and cook it according to package directions. While the pasta boils, melt the butter in the same skillet over medium heat. Add the leeks and saute them in the butter, stirring occasionally, until they’re softened. Add the lemon juice and as it simmers scrape up the browned bits off the bottom of the pan. Slice the chicken into bite-sized pieces and transfer it to the pan with the butter and leeks. Set aside a couple of tablespoons of the starchy pasta water. Transfer the cooked pasta along with the reserved pasta water to the skillet and toss to coat the pasta in the butter. Add the cheese and toss the pasta with it until the cheese has melted. Transfer the pasta to two bowls. Top each serving with black pepper and chopped parsley, if using. Pounding the chicken will ensure it cooks evenly. I pound mine until it’s about 1/2-inch in thickness. Be sure to clean the leek really well by first slicing it down the middle (lengthwise) without cutting all the way through. Rinse it thoroughly under cold water to remove any grit.